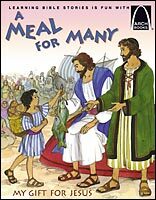 This book is based on the story of the loaves and fishes, focusing on the young boy's gift of his food that in turn was multiplied by Jesus to serve many. (Matthew 14:13-21, Mark 6:30-44, Luke 9:10-17, and John 6:1-13). The purpose of this book is to teach stewardship principles to children. By following the boy's example, children will see that they can give what they have and can be confident that our Lord will use it to benefit many. A Meal For Many by Erik Rottmann was published by Concordia in June 2007 and is our 13633rd best seller. The ISBN for A Meal For Many is 9780758603777. Be the first to review A Meal For Many! Got a question? No problem! Just click here to ask us about A Meal For Many.